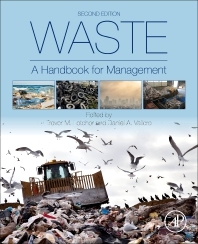 Waste: A Handbook for Management, Second Edition, provides information on a wide range of hot topics and developing areas, such as hydraulic fracturing, microplastics, waste management in developing countries, and waste-exposure-outcome pathways. Beginning with an overview of the current waste landscape, including green engineering, processing principles and regulations, the book then outlines waste streams and treatment methods for over 25 different types of waste and reviews best practices and management, challenges for developing countries, risk assessment, contaminant pathways and risk tradeoffs. With an overall focus on waste recovery, reuse, prevention and lifecycle analysis, the book draws on the experience of an international team of expert contributors to provide reliable guidance on how best to manage wastes for scientists, managers, engineers and policymakers in both the private and public sectors.